Till now we all have known about the features of both the latest big update: Android 5.0 Lollipop and Windows phone 8.1. Google’s Android 5.0 brings a along a fresh new design, performance and battery life improvement, and a new richer set of developer tools and lots of other features. Microsoft’s Windows phone 8.1 is also catching up the attention and is now growing out to give the other smart OS, a tough competition. The latest OS update introduced the long awaited features like Action Center and in addition the best digital assistant ‘Cortana’, all new browsing experience with Internet Explorer 11 and tons of other improvements. Visual representation and User interface of Android 5.0 and Windows phone 8.1 are different but meant to do the same thing. In Android 5.0, we have a home screen with app shortcuts, folders and widgets that we all are familiar with, but, Windows phone 8.1 on the other side has a Start screen populated with what we call Live Tiles. Live tiles are somewhat similar to the widgets in Android, Live Tiles update every minute to give the latest updates of the corresponding app and by tapping the Tile it triggers the respective app. And with Windows phone 8.1 update 1, we got the so called Live Folders, taking the simple creation of Folders like in android a step further by making it live. Now, every one knows about Android and the customization it offers but well, Windows phone 8.1 is now no way behind it. With Windows phone 8.1, we can set our favorite image to display on the Start screen and the start screen with the 3 and 4 column tiles along with many other screens are a lot more spacious now. Android 5.0 should appeal to those who like customizing their smartphone and those who like having complete control over it, while the Windows phone 8.1 is more suitable for people who prefer things clean, simple and easy to organize. Well, Live Tiles aren’t as functional as Android’s widget but on the positive side, Windows phone 8.1 home screen looks very presentable and well organized. Both Android 5.0 and Windows phone 8.1 have a similar approach towards notifications. Both the notification bar and the Action Center are accessible with a swipe down from the top of the screen. Both let us dismiss the notifications with a swipe to the right, while a simple tap triggers the respective application. Android takes it a step further by pushing down the non important notifications to the bottom of the list, while the prior ones are kept at the top. Also, some notifications expand and give us an extra interaction option: for example we may reply to a message at the push of a button. However, in Android 5.0 we don’t have an option to clear all the notifications at once whereas in Windows phone 8.1 we can easily dismiss all the notifications at once with the ‘X’ button at the right corner, or dismiss only notifications from respective applications. In Windows phone 8.1 you are limited to only four toggle options at once in the Action center, but you are free to remove unwanted ones and replace it with the ones you like in the settings menu. However, Android 5.0, in addition to these toggle buttons, presents us with a brightness slider with other options in the same menu. Android 5.0 lists the notifications right in the middle of the lock screen, making it harder to to miss any notification. Again, you may swipe or tap a notification to dismiss it or open respective application. Unlike Windows phone, Android 5.0 gives us shortcuts for the phone and Camera apps at the lock screen. On the other hand, Windows phone 8.1 takes this differently, it sticks with a simpler lock screen. We have counters for missed calls, new texts and unread IMs, which is a new thing. If selected, few apps can change your lock screen background daily like Bing, Facebook etc. You can’t access the phone app via lock screen but you can access the phone’s default camera by pressing the physical Camera button or by selecting the camera option in notification. A few weeks earlier, a new lock screen app came into existence, the Live Lock screen beta app. It allows us to change the lock screen with a set of predefined live lock screens, which will be sort of live wallpapers having unique designs, and one of them shows the analog clock. As I mentioned earlier, Android 5.0 is a lot more customizable with the help of static or live wallpapers, move/resize widgets and shortcuts, or apply a third party theme or can directly download a launcher from play store like Nova launcher, Go launcher etc. In Windows Phone 8.1, you can select two backgrounds, either white or black and select theme from 20 given colors and apply them to meet your daily needs. This is helpful for visit to different places, so you can apply a suitable color each time you go to a new place. The new thing in Windows phone 8.1 is that you can simply select a background image for your start screen as mentioned earlier, setting a background image makes few of the tiles transparent so that you can see the background wallpaper easily whereas a few tiles remains colored. You can resize/move the tiles around and this way personalize your start screen the way you want and as said earlier, you can add an extra column of Live Tiles in the settings menu. Google Now, as you know is android’s virtual assistant. It’s a kind of virtual assistant which attempts to provide relevant information to you all the time. It does that by analyzing with the user’s search habit, location pattern, and with integrating with core android apps and services. If you have to board a flight coming in a day, Google Now will provide you with flight updates ahead of time. It also responds to natural language queries and commands. You may ask it to send a message to a contact or even dial a contact, set an alarm or reminder ,give you weather forecast, etc. And the best thing is that Google now can be accessed from any screen, you just need to call it with your voice command. This works good unless and until the phone is not in stand by. Okay so have you heard about Cortana. You must have if you or anyone you know owns a Windows Phone. She’s the highlight of the OS upgrade from Windows phone 8 to 8.1. 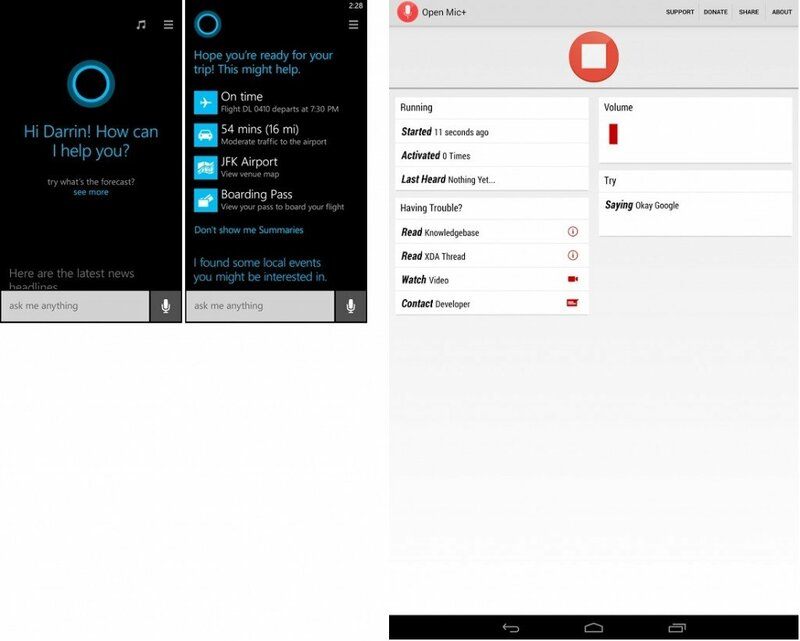 Cortana is much like Google now, except she is not only a virtual assistant but a personal virtual assistant. Apart from making calls, sending text and doing Bing search, she has a lot more to do. Like you can ask her to tell your events on Saturday and she will tell you all the events. You can also ask her to set an appointment, and in case if there is conflict, like you have another appointment at same time she will bring this to your notice. You can even ask her to reserve a seat in a good restaurant. She can remind you for things you told her to. The best of Cortana’s feature I think is that she lets you add people based reminders. For example, say” Next time I call xyz, remind me to wish him.” And when you will call that contact you will get a reminder on your screen. She can even post on behalf of you on Facebook, Hulu Plus, Skype and many more third party apps. Apart from these she has your interests and you can tell her about yourself by simply saying, ”take a note”. She can read all your emails with your permission so that she knows more about you. You can ask her questions and express your views to her and she will respond to you like a real world assistant does. So, this is Cortana, your very own personal assistant. The stock camera in Windows phone 8.1 is a basic one, made comfortable for beginners. At one side we have buttons for still camera, Burst mode and Video mode while on the other side we have shortcuts for features like setting ISO, resolution, choose lens, Scenes, Exposure, white Balance and Camera Roll. These features are good and the Camera captures clear, sharp images. If you own a Lumia, then you can have Nokia Camera which gives you a professional control over your camera. Google Camera, which is the stock camera app in Android 5.0, has very little manual controls. You can have handful of features like panorama, Photo sphere, HDR+ and Lens Blur.